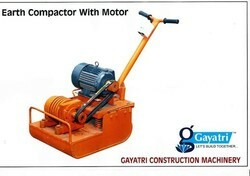 Leading Manufacturer of earth compactor from Ahmedabad. Our company is the prominent company in the domain of manufacture, supply, export and wholesale of Earth Compactor which find application in the road construction work. As their name implies, these Vibrating Plate Compactor have compact construction and are manufactured from supreme quality of metal which is quality tested by our quality inspectors. Splendid finishing and long service life are the hallmark of these plate compactors. Forwarding Motion : 14 to 20 Meters per minute (45 to 85 per min) depending upon back till or surface conditions.